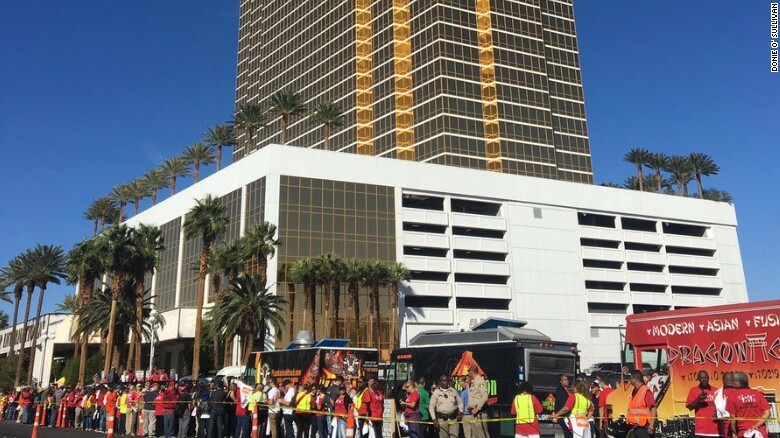 Today hundreds of workers protested and rallied in front of Trump Hotel Las Vegas. Culinary Union members, Trump Hotel Las Vegas workers and local community partners (American Bridge, America’s Voice, Battle Born Progress, Center for Community Change Action, Forward, For Our Future, iAmerica Action, Latino Victory Project, Next Gen Climate Nevada, the Nevada State AFL-CIO, the Progressive Leadership Alliance of Nevada Action Fund, Planned Parenthood Votes, Mi Familia Vota, Move On, and She Wins We Win) built a wall to symbolically block hate. There was about 400 workers and community members in front of the property and several taco trucks that provided free tacos to those in attendance. Trump Hotel Las Vegas workers voted to unionize and want their boss, Donald Trump, to negotiate a contract so they can have fair wages, job security, and good health benefits. Donald Trump’s workers are treated like second-class and are paid $3.00 less per hour than other union workers on the Las Vegas Strip – NOT FAIR!!! It’s time to Donald Trump to negotiate with his employees! He says he wants to “Make America Great Again,” so then he should start with his own hotel here in Las Vegas and treat his workers with respect!